Symmetry iphone x case by Sandi OReilly. Protect your iPhone X with an impact-resistant, slim-profile, hard-shell case. The image is printed directly onto the case and wrapped around the edges for a beautiful presentation. Simply snap the case onto your iPhone X for instant protection and direct access to all of the phone's features! Thank you so much, Jerry, appreciate your Fave/Like!! Dan, thank you very much for featuring this image in "Premium FAA Artists"!! Thank you so much, Henryk, appreciate your Fave/Like! 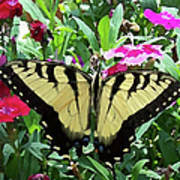 Randy, thank you so much for your encouraging words and for featuring this image in "Wisconsin Flowers And Scenery"!!! Thank you so much, John, for featuring this image in "Images That Excite You"!!! Appreciate your featuring this image in "Photo Manipulation", Martin! Thank you so much!! Thank you very much, Dora, for featuring this image in "Visions of Spring"!! Brenda, thank you so much for your wonderful comment and Fave/Vote!! Thank you very much, Tessa, for your lovely comments and your Like/Fave!! Joseph, thank you so much for your wonderful comments!! So appreciate them and your F/V/L!!! Love this treatment & natural subject, flowers, foliage, light & dark textures Sandi. What size do you shoot in to achieve this end subject? V/LIKED/Added to fav collection. Les, sounds like you appreciate nature like I do, thank you so much for your great comments and appreciate your f/v!! Susan, thank you very much for your great comment, and you are welcome!! What a great shot, Sandi. I love the color and content. Nice work! P.S. Thanks for your comment on "Tranquility". 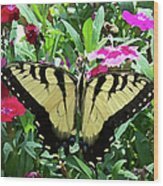 FEATURED: Visions of Spring, 12/22/2015 Photo Manipulation, 12/22/2015 Images That Excite You, 12/22/2015 Wisconsin Flowers And Scenery, 12/22/2015 This Swallowtail loved this plant and she spread her wings and I was able to capture the perfect symmetry of her markings and joy this creature brings for us to see. 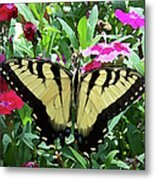 We have not seen as many of the butterflies we usually see this past summer and consensus is around our area that others have noticed this also. I was glad I took this image when I did and finished it in Photoshop and Corel Painter by painting with different brushes to give it a painted look. The image was taken with a Nikon Nikor 105mm macro lens. 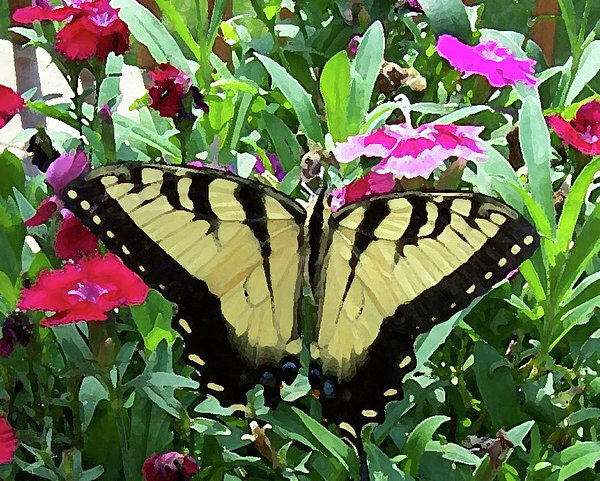 Fine Art Swallowtail Butterfly Photography and Art by Sandi O'Reilly, All Rights Reserved and Copyrighted in the US and Internationally. ALL FAA WATERMARKS ARE REMOVED AT THE TIME OF PURCHASE!